Hf is probably a special case. We would like to use HDLC to the extent possible. But, link reliability would be poor. We need a combination of ARQ and FEC (forward error control) protocol. We envisage a special board (similar to the TNC) for hf packet links. This subject will be developed later. 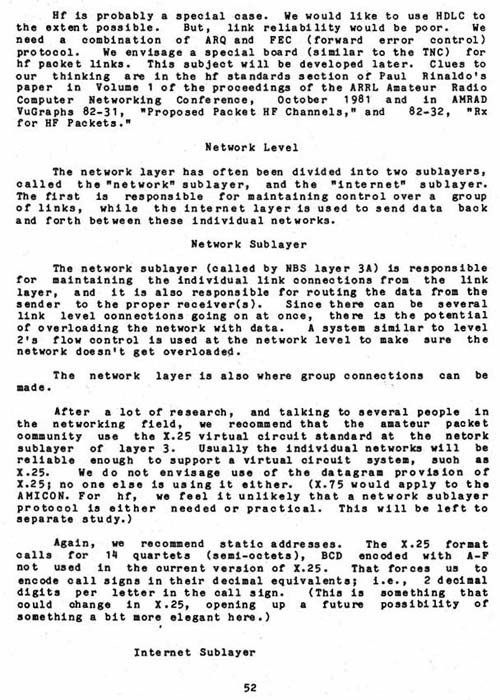 Clues to our thinking are in the hf standards section of Paul Rinaldo's paper in Volume 1 of the proceedings of the ARRL Amateur Radio Computer Networking Conference, October 1981 a nd in AMRAD VuGraphs 82-31, "Proposed Packet HF Channels," and 82-32, "Rx for HF Packets." The network layer has often been divided into two sublayers, called the "network" sublayer, and the "internet" sublayer. The first is responsible for maintaining control over a group of links, while the internet layer is used to send data back and forth between these individual networks. The network sublayer (called by NBS layer 3A) is responsible for maintaining the individual link connections from the link layer, a nd it is also responsible for routing the data from the sender to the proper receiver(s). Since there can be several link level connections going on at once, there is the potential of overloading the network with data. A system similar to level 2's flow control is used at the network level to make sure the network doesn't get overloaded. The network layer is also where group connections can be made.